The online MSc in Information Design programme is suitable for a wide variety of individuals - including students from a humanities background looking to move into the field of technical communications, individuals working as engineers or developers who are looking to move into the field of technical communications and individuals working as information developers who are looking to advance their career with a professional master’s degree in the area. Information will no longer be developed as monolithic documents but instead a topic based approach will be used in modern day information development practices. Students will be able to create standalone information solutions that can be easily reconfigured and reused to suit various audience stakeholders at a reduced cost of production. Our online MSc in Information Design programme blends a range of diverse skillsets that students will be able to embed into their everyday work practices, so that graduates will be able to perform a range of job functions across multiple industries. Students will develop a rigorous standard in the production of clear, concise technical documents using correct English. At the same time, students will learn about structured content through XML and Darwin Information Typing Architecture (DITA), providing them with a platform independent, vendor neutral source language for publishing documentation to any output format. In addition to these technical skills, students will develop skills in project management and best practices rooted in modern day information development. Students will also develop audience and research skill - developing an ability to know and understand who will be reading their documents and how to adapt writing styles or the tone of the document to acknowledge different stakeholder groups. What are the benefits of doing the course online? Doing the course online offers a large number of benefits to participating students. CIT’s online programmes offer you the opportunity to study within your own schedule and at your own location. Using state of the art communication and education technology, students will have live access to CIT lecturers and a range of international speakers. Live and recorded content allowing for meaningful interaction with fellow students and lecturers is a cornerstone of our lecturing approach on this programme. Thus, participants experience the benefits of various types of learning in an environment that is conducive to busy lifestyles. What does an information developer actually do? Information Developers may also be referred to as technical communicators, documentation specialist, information architects, editor, or go by another name. Regardless of the name, information developers perform a broad range of job functions across diverse industries as individuals who bridge the gap between subject matter experts and that of the end user. The role of information developers is becoming increasingly important given that society is being driven by technology and information developers provide the voice in communicating how issues incorporating technology are framed and developed. The Society of Technical Communication (STC) define information developers or technical communicators as individuals that communicate using an instruction based focus on technical or specialised topics using technology. In essence, information development and technical communications ensures that designs, products, systems and methodologies are documented and conveyed to their target audience to maximise its business value to the organisation. We have internationally recognised industry leaders in the areas of project management and information strategy teaching on the programme who include Dr JoAnn Hackos and Ms Ann Rockley. In addition to industry experts, academic experts in the field of XML, technical communication and information experience also teach on the programme. 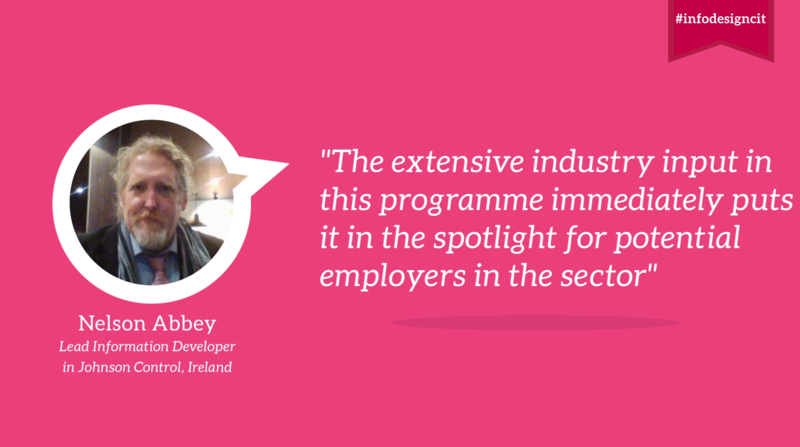 These articles highlight the high level of industry engagement in the development of the programme to address the shortage of skilled information developers. The Institute of Scientific and Technical Communicators in the UK publish a free online newsletter each month called InfoPlus which featured an article about the programme. Philip Large, a student on the MSc in Information Design & Development also shares his experience of participating on the programme which was published also in InfoPlus. For more information on the programme, please click here. Detailed information on the timetable for the MSc in information design is available here.